One of my biggest struggles of being vegetarian, is finding a healthy salad that is satiating. A green salad checks the box of healthy but fills me up for nothing more than 30 minutes, and then a pasta or potato salad don’t always check the box when I’m trying to eat clean. I’ve figured out that adding whole grains, lentils or beans to my salad is the way to go. They give the added protein and fiber aspect and actually fill me up. 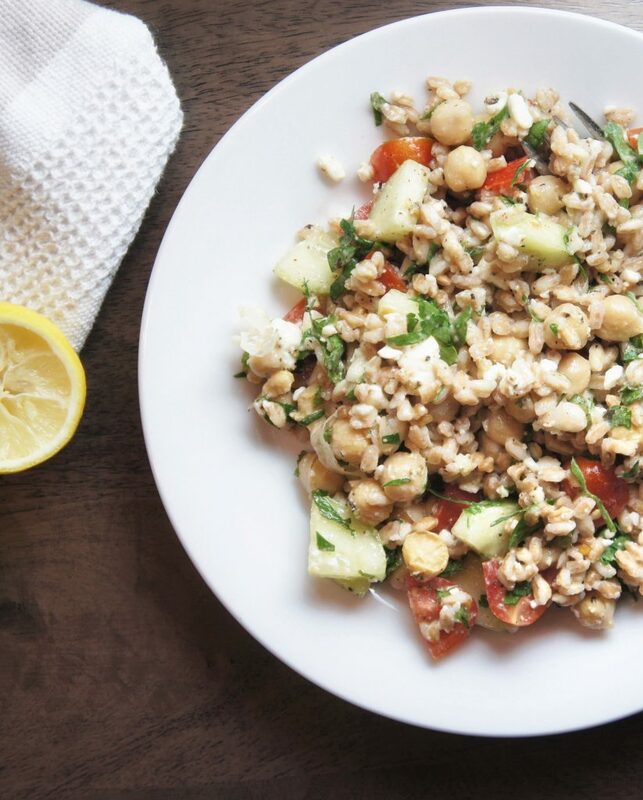 This version of the Greek salad, incorporates chickpeas and farro with fresh herbs and any vegetables/ greens that you find in your refrigerator. While I used cucumbers and grape tomatoes, you can also add olives, red onions, bell peppers, spinach, arugula- any or all of them would taste great! I also recently realized that there are two types of people in the world – those who love olives and those who don’t. I definitely fall in the second bucket. While I’m not the biggest fan of olives, I recently made this salad for a potluck with kalamata olives and all the olive lovers loved it! For anyone who has not cooked with farro before, it is such a versatile grain to keep in your pantry. Farro is an ancient grain that is now beginning to gain traction for its health benefits and ability to adapt to different recipes. 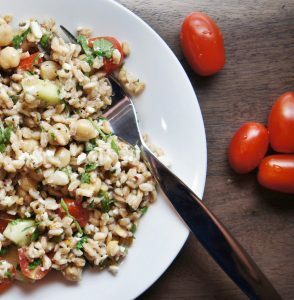 I use it in salad, soups, grain bowls- oh my gosh you can do so much with farro! Its has a nutty flavor and adds such a wonderful texture. I have a hearty minestrone soup recipe with farro that I hope to share soon. You should be able to easily find farro at your local grocery store, it is usually shelved in the aisle with all the grains. 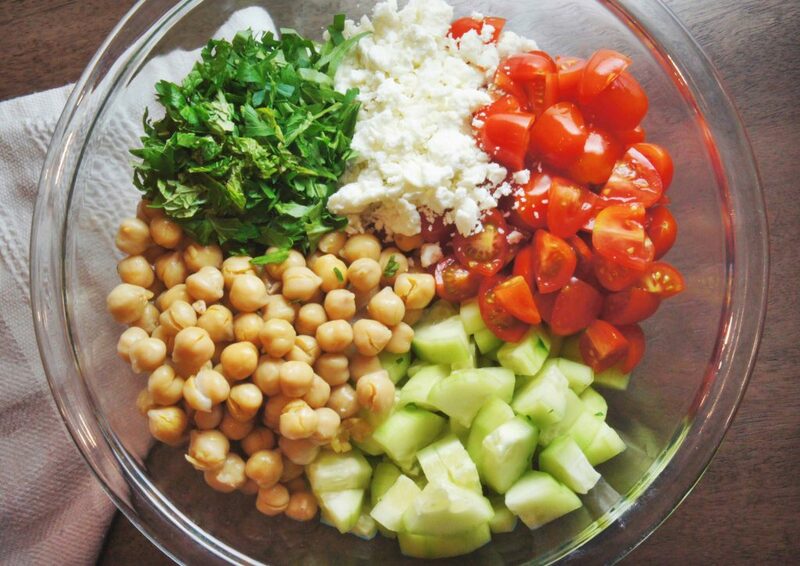 This salad makes for very easy prep ahead lunch item. The dressing in simple, refreshing and so versatile. You can make a big jar of it to store in your refrigerator and pour over any other salad. And the fresh herbs give it the perfect addition to get you ready for spring! I know I’m ready for some sunshine and long hours of day light! This salad is refreshing, satiating and so perfect for the early onset of spring! It makes for a great pack ahead lunch, a wholesome side to your dinner or a crowd pleasing item for your next gathering! 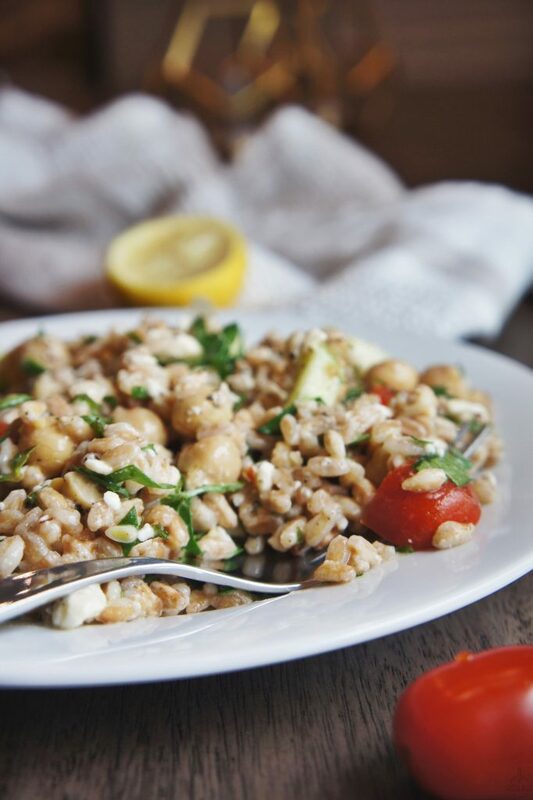 With the addition of chickpea and farro it is packed with protein, fiber, texture and not to forget oodles of flavor! 1.5 cup grape/ cherry tomatoes cut into quarters or 3 regular tomatoes (roma tomatoes) cut into cubes. Cook the farro as per the instructions on the packet. 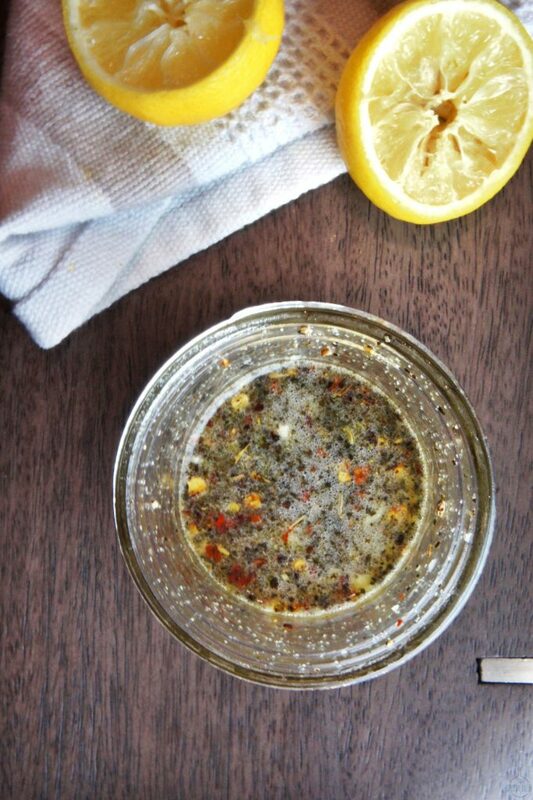 While the farro is cooking, in a small mason jar or bowl, mix all the ingredients for the dressings- evoo, vinegar, lemon juice, garlic, dried oregano, red chili flakes, salt and pepper. Give it a couple of good shakes, to mix the oil and vinegar. 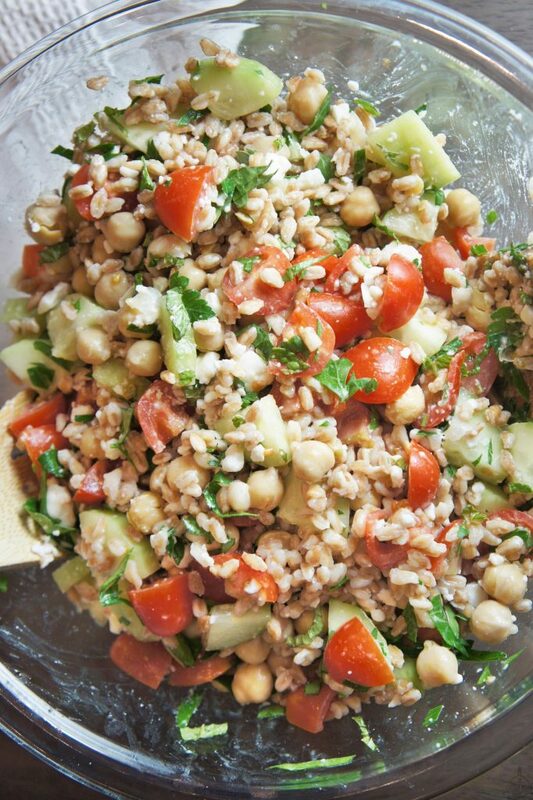 Place the cooked farro in a large salad bowl. 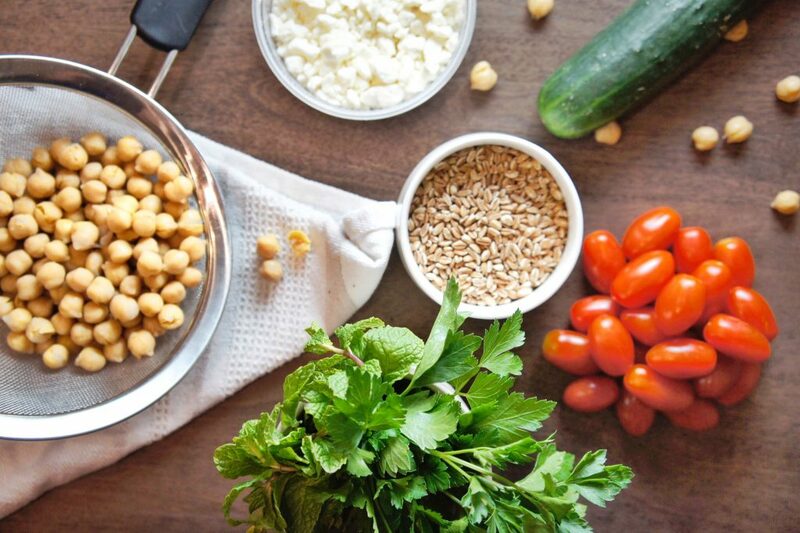 Add the chickpeas, veggies, parsley and mint. Pour in the dressing and toss well together. Top with feta cheese and a dash of ground black pepper. This is a recipe you can have so much fun with! Tweak it up with veggies and greens of your choice- cucumbers, tomatoes, olives, bell peppers, red onions, spinach, arugula, artichokes- the possibilities are infinite! Substitutions: In case you have any difficulties finding farro at your local grocery store, you can substitute it for any other whole grain like barley or quinoa.